From Spanish capital to Spanish capital the Camino Real de Tierra Adentro ran from Mexico City, Mexico to Ohkay Owingeh, New Mexico. The portion of the Camino Real in New Mexico is about 404 miles beginning in El Paso running northward parallel in some areas by I-25. The camino was formally established as the royal road or Camino Real by Juan de Onate in 1598. Going westward from Mexico City to Tucson and on to San Francisco sometimes associated with Calle Real (within the US state of California), usually refers to the historic 600-mile road (US Route 101) connecting the 21 Spanish missions in California. The El Camino Real de los Tejas covers the modern highwaysTexas 21 (along with Texas OSR) and Louisiana 6,roughly follow the original route of the trail. The trail has a 2,500-mile length from Mexico City to the US in Laredo, San Antonio, to Nacogdoches. For centuries the Native Americans had used the trail routes for trading between the Great Plains and Chihuahuan Desert regions. The Caminos Real first followed and marked by Spanish explorers and missionaries in the 1700s. The trail was nationally significant for its use in conquest, colonization, settlement, missionary work, supply, commerce, cultural exchange and military campaigns. The first breeding horses, cattle and sheep entered New Mexico and the American West was through the Camino Real as did gun powder, written language, iron, and Christianity. The road also served as a lifeline for the new Spanish immigrants for continued supplies from Mexico and Spain such as fine cloth and spices. The Jornada del Muerto was ominous and respected, yet part of the Camino Real de Tierra Adentro. A picturesquely beautiful desert of sun and sand, which remains one of New Mexico’s most distinctive landmarks, and whose history comprises one of the West’s most fascinating legacies of the past. As a geographic name, “Jornada del Muerto” is the desert region the Conquistadors had to cross to make it from Las Cruces, NM. to Soccoro, NM. As a name-place, “Jornada del Muerto” is a loose translations of “single day’s journey of the dead man“ hence “route of the dead man”) in the U.S. state of New Mexico was the name given by the Spanish conquistadors to the Jornada del Muerto Desert basin, and the particularly dry 100-mile (160 km) stretch of a route through it. The trail led northward from central Spanish colonial New Spain, present-day Mexico, to the farthest reaches of the viceroyalty in northern Nuevo México Province. The route later became a section of the El Camino Real de Tierra Adentro. When Juan de Onate began his journey in January 1598 from Santa Barbara, Mexico just south of Chihuahua, he carved a new and shorter trail as part of the Camino Real through the desert north of El Paso, nearly a quarter of a century before the Mayflower sailed from England. Onate rested, gave thanks, and celebrated the first Thanksgiving in the New World on April 30, 1598. The journey started from Santa Barbara, Chihuahua. There were 400 men, some were military and some had their families with them. They had 83 carretas (wooden wheel wagons), seven to eight thousand livestock – horses, sheep, goats, etc. Together this formed a four-mile long procession through the desert. It was a long journey. Four days before arriving at the Rio Grande, somewhere near what is now San Elizario, they ran out of water. Their written records tell us that when they arrived at the river on April 20, 1598, two of their horses drank so much water; they burst their sides and died. They rested under the cottonwood trees for ten days; they swam, fished and hunted. There was a lot of wild life and vegetation in those days. Since the Rio Grande was a powerful river, it often flooded the area in the spring. By 1821, American traders had blazed the Santa Fe Trail from Missouri to New Mexico linking the United States and Mexico. Wagons carrying manufactured goods from the east coast and Europe poured into what is now New Mexico. Many American traders continued on down the Camino Real de Tierra Adentro to Chihuahua City in Mexico. In 1846 during the Mexican War, US troops invaded New Mexico along the Santa Fe Trail. By 1850 Mexico had lost almost half of its territory to the United States. Routes expanded from the Camino Real de Tierra Adentro from Okay Owingeh and Santa Fe east towards Las Vegas, up to Watrous, Cimarron, Trinidad and up to Colorado. Trade along the Santa Fe Trail from the United States was forbidden by both governments, but it took place anyway. New Mexico needed goods and Spain was too far away. The Americans were much closer. In 1821 just south of what is now Las Vegas, NM, 400 soldiers, militia and some Pueblo Indians met a train of Missouri traders. They told the Missourians that Mexico had overthrown Spanish rule. Commerce between the US on the Santa Fe Trail was now open! The Atchison, Topeka & Santa Fe Railway (AT&SF) was chartered on February 11, 1859, to join Atchison and Topeka, Kansas, with Santa Fe, New Mexico. . In its early years, the railroad opened Kansas to settlement. Much of its revenue came from wheat grown there and from cattle driven north from Texas to Wichita and Dodge City by September 1872. Rather than turn its survey southward at Dodge City, AT&SF headed southwest over Raton Pass because of coal deposits near Trinidad, Colorado and Raton, New Mexico. AT&SF reached Albuquerque in 1880; Santa Fe, the original destination of the railroad, found itself on a short branch from Lamy, New Mexico. The American section of the Camino Real de Tierra Adentro became a stagecoach route and a string of forts were built along the road to protect travelers from Indian attacks. Photo above are soldiers stationed at Ft. Seldon, NM located at the south entrance of the Journada del Muerto. After the Civil War which ended in 1865, the Camino Real slowly lost its importance to the United States. The Navajo and Apache were defeated in the Indian Wars and made prisoners of the United States. Their land was taken away and they were removed to reservations we still have today, the Navajo Reservation and Mescalero and Jicarilla Apache reservations. The forts were abandoned that once protected the travelers along the Camino Real. Few historical documents record the many women who traveled the royal road. Scribes of Spanish expeditions into the northern borderlands ignored the presence and contributions of courageous women who accompanied the explorers and soldiers. Rarely, if at all, are the names of a few women in the muster rolls, complete with the role they performed. There were 25 women traveling with Onate who not only contributed to the survival of the expedition through their skills in cooking, mending, washing, nursing and packing. It was the women who cared for the sick, comforted the soldiers and other travelers who died along the way. And traveling with Diego de Vargas on the recolonization of New Mexico after the Pueblo Revolt was Doña Ana Pacheco Ortiz, wife of Capt. Cristobal Baca, her daughters. All of these women and their offspring are known to be common ancestors of many people with New Mexico roots. In 1598 the first Spanish settlers in New Mexico traveled up the Camino Real from north-central Mexico. Of the 560 people so far identified on that expedition, at least 20 percent were women. They came on foot, on wagons or horseback, and were the first of thousands of women who suffered the arduous journey traveling back and forth, sometimes more than once, on the trail. The legacy of these women is evident from place names, communities like Socorro, which bear their names. Some women came as heads-of-households while others followed their husbands and families. Some even came as slaves. They all played an important role in expanding and colonizing New Mexico. 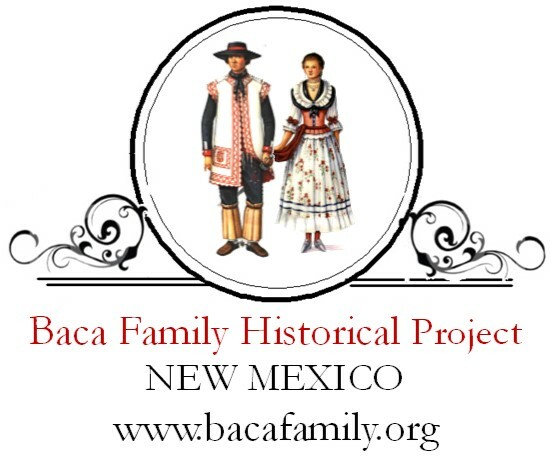 Women defined the culture, history and traditions of New Mexico throughout the 17th and 18th centuries. The people and their cultures who traversed the Camino Real changed the history of the United States and Mexico as no other trail has before or since. Photo: Man with children posing by a fence in, Mora Valley, NM. Circa 1895. Photo: Josephina Baca and family, Belen, New Mexico Date: 1940s. The cultural compromise of this trail created and defines, still today, the Nuevo Mexicanos of today.